A powerful cloud-based omni channel commerce solution that enables retail and restaurant businesses to grow in-store and online. Lightspeed is robust yet easy-to-use software and allows business owners to streamline their entire operation, from complex inventory management, customer loyalty and engagement, easy sales, and indept reporting and analytics. This complete POS system bundle includes everything you need to operate in your business: Lightspeed retail software, iPad Pro, iPad Pro stand, label printer, receipt printer, Dejavoo terminal, cash drawer, payment processing package and 24/7/365 support. Clover allows you to accept mobile payments, credit, and debit cards; giving your customers the flexibility they want. Clover POS assists you with every aspect of your retail business-- helps your business streamline sales procedures, track sales, track inventory and time clock from anywhere with the simple to use applications. Radiant 44 additionally helps you bring all the other support systems together including payroll, automatic deposits, taxes and benefits administration... all for easy, single source access. 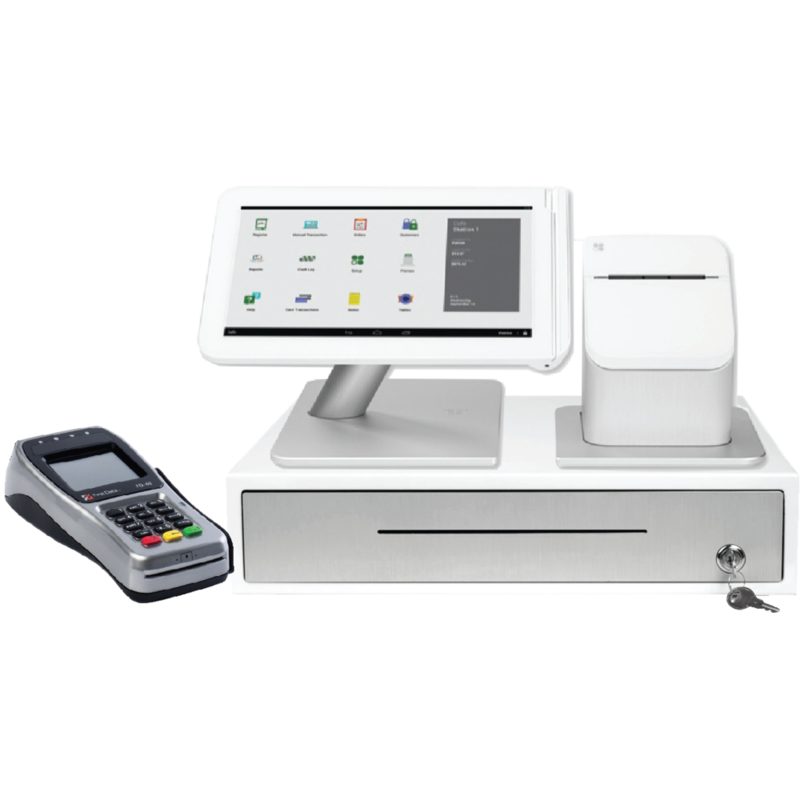 Clover POS Bundle includes: All in One Touch Screen POS and MSR, Thermal receipt printer, cash drawer, clover POS software, FD40 for the Apple Pay® tap’n go technology, and credit card processing module. Excellent for: Bike Shops, Clothing Stores, Liquor Stores, Vape Shops, Breweries, QSRs, Food Trucks, Auto Services, Dog Grooming & Daycare, Nail Salons, Spas, and more. EDGEPOS was designed for nightclubs and bars and specifically for Table Service, Fine Dining, Bar & Nightclub, Pickup & Delivery, Quick Service, and Cafeterias. Easy to use and implement. This bundle includes: All in One J2 225 Touch Screen POS & MSR, Aures thermal printer, impact kitchen printer, cash drawer, EDGEPOS full Restaurant POS software, and credit card processing module. Perfect for: Restaurant & Bars and more. Lavu, another excellent restaurant POS simplifies workflow and is a business management software that improves your bottom line, and conveiently controls all your customer service tools with a single dashboard. Lavu iPad POS is a complete POS system for any service establishment. Comprehensive reports, mobile ordering, and credit card integration make it a hit with small restaurants to national chains. Lavu iPad POS is a proven solution built to make your life easier. Bundle includes: iPad Air with Windfall Stand and MSR, Thermal Receipt Printer, Cash Drawer, POS Lavu Cloud POS Software, and Credit Card Processing Module. Excellent for: Restaurants & Bars, Food Trucks, and more. Add EDGEInsights to any POS to use payment analytics and social media to track trends, automate marketing and grow sales. These proprietary analytics forecast and control your business by understanding how and when you customers shop with you-- so key for operating. Social Media: Do you have a strategy? Your customers congregate daily on multitude of social networking sites. Edge insights provide you with an easy point and click strategy. Marketing Automation: This is key... Automated marketing reminders to customers before, during and after the sale to generate more business. Learn more!